After some months of preparing the event by all the organisation of Explora Commodore, in the end we could enjoy the reunion of all which is related to the Commodore brand and above all those people who are related to classical computing, independent of the system they used and still are using. The work and the time we spent to prepare all were more than worth the job and the success and our impression is, that we carried out all we had promised. It was an easy job with the people who were involved, Retroscroll, Gamemuseum and Pixel Mansions and without forgetting AAMSX, without whose help and experiences the work would have been more complicated. The set up was fast and all fit to perfection. We had a couple of hours to get all ready. We organised the tables, put up the chairs in front of the scenery. We laid out the electric cables and put up all the computers for a day that was going to be unforgettable..
Our 3 groups dedicated exclusively to Commodore, CBM4Ever, Commodore Mania and Commodore Plus, stuck together, one next to the other. Belén and Jesus (CBM4Ever) brought along 5 Amigas and all kind of paraphernalia, articles and magazines related to the history of the 16 bits of Amiga. ….how many memories! Commodore Marina dedicated its space to the 8 bit computers which Commodore produced and also put on show a collection of games, in physical shapes which were produced during the last years, in Spain. Commodore Plus had two computers for playing and a screen on which paraded different kinds of demos and publicity related to Commodore in the company of Kopsec with its shop of all kinds of accessories at prices at the reach of any purse, to build or already ready to use. The music we heard in the room, except for the moments when the speeches were on or the finals of IK+, was played by Neuroflip and aOrante with his group 303 BCN who came, too, representing Amiga & Friends. They bring a c64 and a A1200 and combined several melodies, of classical games and own chipsounds to give the atmosphere we needed to all the event. Enrique García joint us the last hour and brought his arcade joystick for Amiga 500, the A4. He himself told us that his coming here would help him to improve his knowledge and to see the virtudes and problems any user could come across. He had a test bank right there with the users to try it to see how his joystick improved the experience of any game. Who knows him, knows that he is an excellent person with whom you connect the second you talk to him. We hope to see you at the second edition with us again!! The people of Asilo Retro were also in charge of a podcast at the early hour and to talk with two guests about their experiences with the Commodore computers. Kopsec took charge of building a workshop at the fair and to build their MP32c64 live and it was transmitted to the screen that everybody could apreciate the assembly. At the end of the day, the MP3C64 was raffled amongst the assistants. The last speech was given by aOrante and he talked about AmiVJing, a sistem with which we can produce different visual effects in a very easy way for our AGA Amigas. Lots and lots of people fas come. We had no doubts that they come to visit the event, but the assistance of so many users, in the morning as well as in the afternoon, pleased us a lot and gave us the security that this will not be the only edition of Explora Commodore. Besides that we were lucky to have as invited platform at the, almost family members. AAMSX, who brought their tools to show that the standart MSX is a system which also has many fellowers and don't fall behind in modern developement. The subjects of the competitions were planned and developed with English precision due to the good job of the people of Pixels Mansions. The results of the different competitions were written on a board which was right behind the tables and all turned out as we wanted it to be: Perfect! 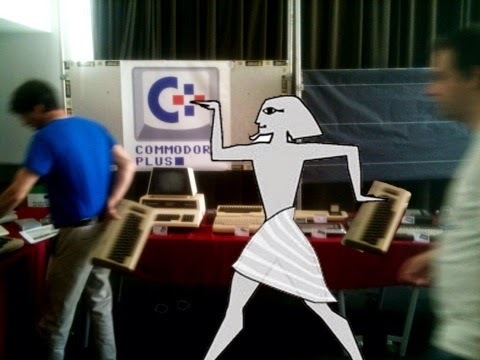 At his side were Retroscroll and its many computers, C64 and Amigas, ready to attract people by means of different games which could be seen and played on the many more CRTs they had brought. On the picture, Davae before starting one of the eliminatories of IK + Gold edition and Ebony next to him. 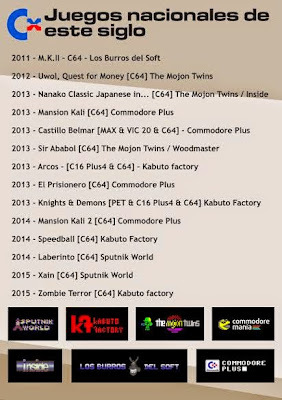 Gamexplotation couldn't fail and its program on youtube, where they compared the same game with its different versions, deserved a space in this event. Have a look at it if you can, it's worth it. This year we were more people in charge to look after the exhibitor of Commodore Mania and Commodore Plus. On the upper picture you can see Ebony, Davae, Kopsec, Bieno and Daniel (McGyver) and on the one under Jesús is the middle of us. We have known Davae for an eternity and he knows all which is connected with Commodore, On the other side, Kopsec, Daniel & Jesús holded the tester, the welding iron and fixed all which has to be done and if they had the necessary tools to do so. Amongst those three they have all knowledge and the larger part of the things the people brought along can be repaired or given a solution for the user. The picture at the end of the day , from Pixelmansion. We would like to thank each one of the people who made possible that Explora Commodore could take place. Each one of you, starting from the expositors to the users that came from any part of Spain , are part of the event and in the end the computers are the ones that unite us all in friendship. We are waiting for you at the second editon of Explora Commodore. A special 'thank you' to Jordi Aubi for many of the pictures which are here in the summary. You can go to the oficial Explora Commodore link HERE.